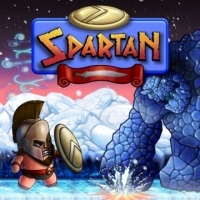 Box Text: Spartan is an epic 2D platformer powered by Unreal Engine 4. Featuring silky smooth animations, pixel-perfect controls, challenging gameplay, huge non-linear levels and an awesome original soundtrack, Spartan is taking classic platforming to the next level, UE4 turbocharged style! Help King Leo recover his City-State's stolen goods and punish whoever is responsible for daring to cross him. With only your trusty shield and sword to protect you, you will face ferocious mythical monsters and bone snapping traps in this intense platforming adventure. This is a list of VGCollect users who have Spartan in their Collection. This is a list of VGCollect users who have Spartan in their Sell List. This is a list of VGCollect users who have Spartan in their Wish List.